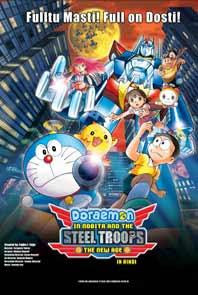 Home Doraemon The Movie: IN HINDI Full (HD) Doraemon in Nobita and The Steel Troops. After years of admiration for Sueno's robot, Nobita finally convinces Doraemon to create a similar special robot. What next? The two are out collecting bits and pieces to assemble the robot toy of their dreams. However, the raw material gathered actually belongs to a special robot who dismantled once from the heavens. Naturally then, the toy robot is no longer a toy; it's the biggest robot ever, Zanda Claus. And big is his role too -- not just entertaining, but also to save planet Earth from the Robot Army that plans to capture all Earthians.